What is like to feel anxiety? Is there such a thing as art therapy for anxiety? How can anxiety painting really work? Note: This article is not a specialized article about mental illness, but a personal experience and how I deal with this problem. This represents my own research on this problem. For proper help, please contact authorized specialists such as psychiatrist or psychologists. The subject I’m tackling is sensitive nowadays, but more and more people suffer from it. I’ll tell you how it feels for me. It feels like internal combustion. My anxiety feels like a fire burning down from inside. This type of anxiety is related to everything in my life: worries about life, career, money, relationships, social phobias, fear of the future, but many times is just anxiety without a real reason (at least this is how it seems). For this reason, I quit my full-time job and tried doing something I like for a living. I wanted to find solutions to escape from my mental prison and feel more at ease. Working with a group of people made me feel constantly anxious and nervous. Also, doing a job I don’t love made me frustrated. I decided I can’t do it anymore and I must do something that doesn’t make me feel social anxiety anymore. There are many things and situations that trigger my anxiety and very few things that help me cope with it. That’s why I decided to search for some work I could do from home. Now I want to share with you my techniques of art therapy for anxiety and how to do anxiety painting. This activity helped me deal with a lot of mental pressure and depression and now I want to help you too. Let’s begin with the beginning. Anxiety is a behavior or thought generated as a mental response to feelings of worry, anger or stress. The trigger could be an actual thread in reality, but sometimes it’s the anticipation of what could go wrong in the future. The purpose of anxiety is to keep your senses sharp and your mind vigilant in the proximity of danger. It’s the feeling that makes you stay and fight, or run for your life. It doesn’t feel like it’s something bad, does it? Anxiety is supposed to be triggered only in dangerous situations. We face worrisome situations every day and this is not a bad thing. It keeps us safe and sound. When the fear and worry feelings are prolonged, that’s when the anxiety becomes a problem. Its symptoms interfere with the daily activities and anxiety becomes a mental disorder affecting life. Anxiety comes in various shapes and the most common are the following. This problem shouldn’t be taken up lightly because it could result in serious health problems. Don’t be afraid or ashamed to ask for help. 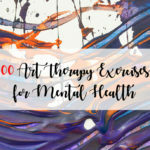 How can art therapy relief anxiety? Art therapy for anxiety is not a new concept. It’s well known that performing arts helps the brain disconnect from the cognitive process and tap into a self-expressing behavior. The primary helping activity and most common is “talk therapy”. But, for my experience, it doesn’t help as much as it should. On the other hand, art therapy helps anxiety because it triggers creativity and handiness. 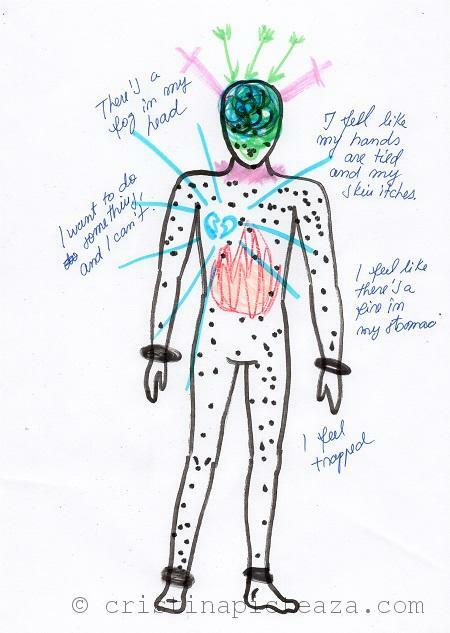 You don’t have to acquire any drawing skill to benefit from this type of healing activity. The following pen drawing is an artwork I did in a night when I felt that I couldn’t escape from my anxiety and depression. It felt like my thoughts would suffocate me and I couldn’t be my true self. No matter how much I tried to take of that poker face mask of, my overthinking would kick in and stop me. Here, my thoughts are represented by the flowing hair entangled on my hands and neck. The hair is both suffocating and restricting my free movement. After drawing this sketch I felt relieved. I could feel the anxiety and stress leave my body. I really had a good night sleep, that day. We should never indulge in these destructive emotions and we should always search for a method to get rid of them. Why is art therapy good for you? This exercise’s purpose is to make you aware of how your mind and body feel. It helps you acknowledge your emotions and sensations. Download the following template and print it on an A4 paper. You can also copy it freehand on a piece of paper. Click on the following image to download the PDF file and print it. It doesn’t have to be completely accurate. Fill in the human figure pattern with shapes, colors, and symbols that represent your current emotions. Note on the side of the paper what it means every coloring and drawing you create in the figure. Remember that this exercise is supposed to relax you and not make you more stressed. The basic idea is to imagine you step out of your body and observe it in an objective way. Try to be aware of all your emotions and body sensations. Don’t stress about this, just go with the flow. See the following example for reference and ideas. Try focusing on how your current emotions feel. This exercise is an art therapy for anxiety that is supposed to help you put on paper your situation. It helps you see the big picture and find solutions to cope with the problem. On a large paper, draw yourself the way you can. It can be a stick figure if you want to. Doesn’t have to be realistic. You can use the following template I drew for you. Download the following PDF and print it to start the art therapy for anxiety exercise. Outside the bubble draw or write the names of all the things that make you feel anxious or depressed. It doesn’t have to be too intelligible. If you know what symbolizes then it’s fine. Think of all the things that got you all stressed and angsty. Draw and color them the way you feel. It’s important to bring on the table everything that is a problem so we can find a solution for each one of them. After drawing all that is bad, we begin drawing inside the bubble. Here we will draw everything we are thankful for family, health, objects, love, friends, and others. Take the time to think about everything you love and care about in your life. The purpose of this exercise is to acknowledge the anxiety triggers (the problems we face every day) and to find protectors (the things that are good and fill our life). So, no matter what problems are outside the bubble, in our lives, there are always good things that protect and nurture our spirits. Another exercise is to use the same template from the first exercise and draw the human figure in a situation that would put at ease and help you relieve the anxiety. This exercise can be done without the template if you want. Simply paint on a piece of paper a place or a situation that would make you feel good: a landscape, a cute animal, your family, your hobby, a good situation that you would like to happen to you. You can draw the figure in a sunny place, with the family, practicing a sport, or solving some difficult situation in an easy way. Download the template from the following link to start working on this exercise. The purpose of this exercise is to switch the mind from anxiety and stress to peace and pleasure. Focusing on the good things in your life, instead of your problems will help you deal with daily anxiety better. It won’t solve your problems, but it will help you build resistance and strength to deal with whatever situation might come your way. This exercise can also help you find solutions to problems you face, but you were not aware of them before. You can send me links to your drawings or send them to my address: [email protected] and I will post them in a future article. In the section below you can comment and tell me how these exercises worked for you, or if you know other ideas of how art therapy for anxiety can solve these mental issues. Life is not easy and we all deal with anxiety every day. I am suffering from anxiety on a daily basis, but painting and drawing helped me deal with my problems better and stopped my self-destructing behaviors. In conclusion, I hope this article helped you too because I know how terrible it feels. I embrace you and I believe in you.